A vacuole is an organelle in cells which functions to hold various solutions or materials. This includes solutions that have been created and are being stored or excreted, and those that have been phagocytized, or engulfed, by the cell. A vacuole is simply a chamber surrounded by a membrane, which keeps the cytosol from being exposed to the contents inside. Because vacuoles are surrounded by semi-permeable membranes, they only let certain molecules through. A vacuole has a broad definition, and includes a variety of membrane-bound sacs. The membranes are composed of phospholipids, but each organism may use slightly different phospholipids. Embedded in the membranes are proteins, which can function to transport molecules across the membrane or give it structure. Various combinations of these proteins allow different vacuoles to handle and hold different materials. In each organism, different genetics cause different proteins to be embedded in the membrane of the vacuole, which allow different molecules through, and gives the vacuoles different properties. Most plant cells have evolved to use vacuoles as water storage organelles, which provide a variety of functions to the cell. Animals don’t rely on this water storage for the rigidity of their form, and use their vacuoles for the storage of various products, and for exocytosis and endocytosis. In plants, a large vacuole occupies the majority of the cell. This vacuole is surrounded by the tonoplast, a type of cytoplasmic membrane that can stretch and fills itself with a solution known as cell sap. The vacuole also fill itself with protons from the cytosol, creating an acid environment inside of the cell. The vacuole can then use the chemical gradient created to transport materials in and out of the vacuole, a type of movement called proton motive force. This includes the movement of water and other molecules. 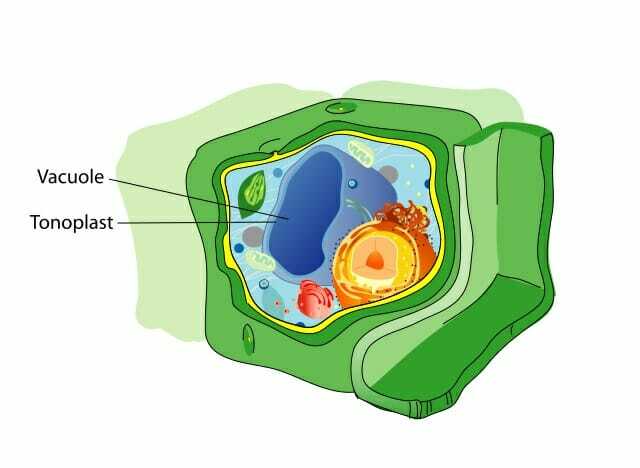 The following is a picture of a plant cell, and the vacuole inside. Plants use their vacuoles for a second function, which is of utmost importance to all plants. The vacuole, when completely filled with water, can become pressurized and exert a force on the cell walls. Although the force in each cell is small, this turgor pressure allows the cells to create a form, and stand up to wind, rain and even hail. Although woody plants create additional proteins and fibers that help them stand tall, many non-woody plants can reach a height of several feet on turgor pressure alone. While this is an efficient way for plants to structure themselves, the plant will droop when the pH balance is off, or they don’t have enough water. If you see your houseplants drooping, make sure they have water. Oftentimes a quick drink will have them from wilted to turgid in a matter of hours. If that doesn’t work, check the pH of the soil. Without the right conditions, the roots can’t take up water or nutrients to store in the vacuoles of the cells, and the plant wilts. Change the pH, and the plant will stiffen right up. A vacuole is used whenever a large amount of substance is taken in through endocytosis, or excreted through exocytosis. Many cells, plant and animal, take in substances and must store them separate from the cytosol. This could be because the substances are reactive, in which case they will cause unwanted reactions. It could also be because the substances would interfere with cellular processes because they are two large. Lysosomes are vesicles used to intake substances to be digested. Sometimes these lysosomes can fuse to form a large, digestive vesicle that can digest nutrients in an acid environment, then transfer them to the cytosol or other organelles to be used. This process is endocytosis, and varies among different types of cells. Going the opposite direction, many cells function as secretory cells, and must produce and excrete large amounts of different substances. The substances are produces in the endoplasmic reticulum, travel to the Golgi apparatus to be modified and labeled for distribution. The substances can then be put into vesicles. The vesicles travel into the cytoplasm and can merge into a larger vacuole before being excreted. This is known as exocytosis. The vacuoles that carry different substances to and fro vary in structure in different cells, and even within cells when they have different functions. An animal cell may contain many vacuoles that preform many functions. An example of an animal cell and its vacuoles can be seen below, the smaller unlabeled sphere would be vesicles. Once they fuse together, they would also be considered vacuoles. Vacuoles are able to store many different types of molecules. Fat cells, for instance, store huge amounts of lipids in specialized vacuoles. This allows single cells to store a large amount of fat, which organisms can use when resources are low. The expandability of the vacuole means an organism can gain or lose weight without too many cells being created or lost. Other times, vacuoles of organisms are used to create entire ecosystems, in which symbiotic organisms can live. Coral polyps often eat algae through endocytosis, but the algae are allowed to live in vacuoles within the coral. This allows the coral to gain the oxygen and nutrients given off by the algae. Vesicle – A smaller version of a membrane-bound vacuole, many of which can converge to make a vacuole. Lysosome – A special vesical containing digestive enzymes. Exocytosis – The process of excreting material from the cell. Endocytosis – The process of taking materials into the cell. 1. In some photosynthetic bacteria, known as cyanobacteria, a large portion of the cell in taken up by a gaseous space. The membrane surrounding the space is only permeable to gases, and as such, no cytosol can enter the space. This accumulates gas in the space, and helps the cyanobacteria float. The bacteria must float to stay in the sunlight, and continue photosynthesizing. What is this organelle called? C is correct. Cyanobacteria are some of the few bacteria that have additional membranes inside of their cell. This vacuole, although it does not let any water through, is still a semi-permeable membrane that contains a certain material from the rest of the cell. Because it is so large, it is not considered a vesicle. Also, it does not contain any digestive enzymes, therefore it is not a lysosome. 2. Garlic contains a powerful natural molecule that has been found to reduce inflammation and aid digestive health. This molecule, allicin, is produced when the enzyme alliinase and the substrate alliin are mixed. However, allicin doesn’t exist until a garlic cell is crushed. The allinase is found in the cytosol. Where is the alliin found in a garlic cell? A. In the cytosol as well. B. Stored in a vacuole. C. Inside the endoplasmic reticulum. B is correct. When garlic cells are crushed or cut, the vacuole is broken, creating allicin when the enzyme and substrate mix. While some alliin may be produced in the endoplasmic reticulum, the majority of it will be stored in a vacuole, so the endoplasmic reticulum may be used to produce other substances. Thus, when the vacuole is crushed along with the cell, the enzyme can go to work on its substrate, creating allicin. 3. Which of the following could not be a function of the vacuole? A. Storing lipids produced by a cell, to be excreted into the body. B. Containing the DNA of an organism. C. Holding a large cellular intake while it is digested. B is correct. 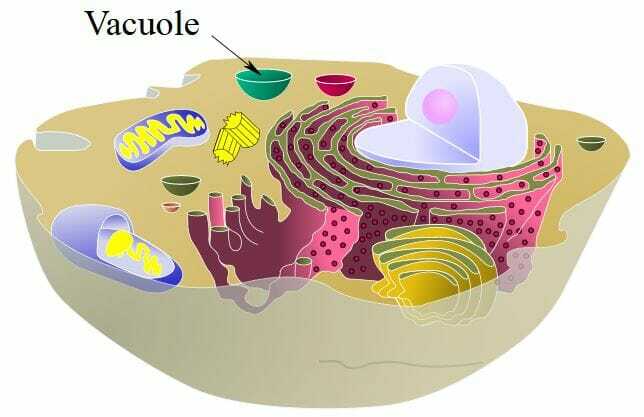 Although the nucleus is similar to a vacuole, it is the organelle that contains the DNA. The nucleus is not a vacuole because the nuclear membrane is highly specialized to only let certain molecules through, including mRNA, which is used to translate the genetic code into protein. A and C are both functions of a vacuole.